Old Hollywood movie poster of the cult period drama, Schindler’s List (1993) for sale. Featured here for sale is an actual surviving vintage Hollywood movie poster of the best historical ever made on the subject of the Holocaust, Schindler’s List. Printed in India during the local release of the film somewhere in the 1990s, this old Steven Spielberg movie poster was originally intended for publicity of the film but never ended up being used. Schindler’s List is often listed among the greatest films ever made in the history of cinema. Besides being a huge box office success, the film won seven Academy Awards (out of twelve nominations), including Best Picture, Best Director, Best Adapted Screenplay, and Best Original Score, as well as numerous other awards (including seven BAFTAs and three Golden Globes), making this poster highly collectible! 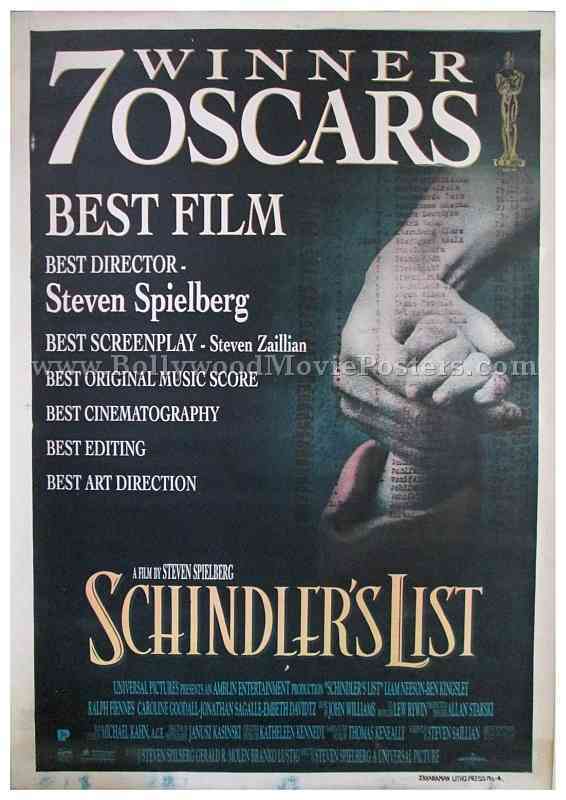 This original Schindler’s list movie poster capitalizes on the success of the film at the Oscars by announcing the title of each award on the poster. Schindlers List is a 1993 Hollywood historical drama, directed and co-produced by Steven Spielberg. It is based on the novel Schindler’s Ark by Thomas Keneally, an Australian novelist.